As we promised our readers that we will soon share an updated article about How to apply for UAE Amnesty 2018, we are here with this informative and important guide which will lead you to the list of UAE Amnesty required documents and fees details. Before proceeding to details, we would suggest you to checkout our previous Article about UAE Amnesty 2018 Guide, please note that UAE Amnesty will begin after 6 days, it will start on August 1 till 31st October 2018. The good news is that Amnesty period can be extend for further period of 2 months depending upon the circumstances. How to apply for UAE Amnesty 2018 scheme? What are the required documents to apply for UAE Amnesty? Can people with previous UAE Absconding Cases apply for Amnesty? Where to apply for Amnesty? Immigration office timings to apply for Amnesty? Will someone face Ban after applying amnesty? Can Absconders avail UAE Amnesty 2018 scheme? What are the benefits of UAE Amnesty 2018? 1: Three Passport size photographs with white Background. 4: If both original passport and passport copy not available, you will need to provide your country ID Card such NADRA NIC, Aadhaar Card, Rashan Card, Driving License of your country or any other valid ID card which shows your record. Expats living in any state of United Arab Emirates illegally (overstay people and absconders) can now utilize the amnesty scheme to either regularize their visa status or to exit the country without paying any overstay fines. The individuals who are staying illegally in any part of UAE can regularize their visas by getting a new sponsor. In simple words, if someone wants to apply for amnesty to remain in UAE, he/she will need to search for a new job, once you found job and company agreed to give you visa, you can submit application through Amer centers for new visa by paying an Immigration fee of 500 AED. There are many who wants to leave the country without facing ban, if you are from one of them, approach Immigration directly and get exit permit without ban. The Immigration will issue exit permit and you can exit the country within 10 days after issuance of permit. A fee of 220 AED is to be paid for the exit permit. Don’t worry for fingerprints or eye scan, the Immigration officer will take the fingerprints and eye scan as normal procedure and will issue you the exit permit accordingly. A sad news is for those individuals who have entered UAE without legal documents, those who entered the country illegally will get exit clearance with 2 years Immigration ban. But don’t worry, this 2 years immigration ban will automatically be removed from system once you have completed the ban period. You can re-enter the UAE after facing two years Immigration ban. Here is the happy news, we have been asked by our visitors many times about can runaway apply for UAE Amnesty, in reply we answered them to wait as it was not final by authorities at that time, but now it is confirmed that if there is an absconding report against an individual, the Immigration will remove absconding report against him/her with fees of 500 AED. Once you have paid fees, immigration officer will issue you exit permit without ban, point to be noted that the exit permit will be issued to you from the concerned Immigration authorities from where the visa is issued. In simple words, if your visa is printed by Dubai Immigration department, you need to visit same Immigration center, if it is printed by Abu Dhabi, Sharjah or any other area, you will have to visit the same Immigration center. So, please make sure, all of those who are applying for amnesty to remove absconding cases must approach the immigration authorities of their respective emirates. Violators can approach the Immigration with original Passport, if you do not have your original passport, you need to get EC which will be issued to you from your consulate. What if my passport is already submitted? Yes, there are many, in case if your passport already submitted in any Immigration office the same will be located immediately and handed over to the applicant directly. How to apply for amnesty without passport? Applying for amnesty without valid passport is possible, in-case if your passport is not available with you or if you have lost it or it is with your previous sponsor, you will need to apply for EC and exit permit will be issued without police report. They will consider requests of the Consulates for repatriation of applicant in special cases. All individuals who are overstaying in the country can utilize the amnesty either to regularize their visa status legally or to exit the country without paying any overstay fines without entry ban. In simple words, overstay people can apply for UAE Amnesty 2018 scheme, no worry if you are on Visit, Tourist or Residence visa, you will be given two options to either change your status from illegal to legal or leave the country. People with previous labour cases will also have the same option to either rectify their status or exit the country. If you are also overstaying in UAE and you want to stay in the UAE, any fine (fees) you have incurred because of your illegal stay in the country will be waived, according to authorities. "This is a great opportunity for all those wanting to modify their status and continue to stay in the country. This is also chance for these people to get jobs after they have modified their status." Can we get 6 Months Temporary Visa? Yes, if you have applied for amnesty and have rectified (changed) your legal status, you can easily avail of the privilege of obtaining a 6 months temporary visa. UAE Government has launched 9 immigration centres across UAE to help Amnesty seekers. Immigration office in SHAHAMA, AL AIN and GHARBIA in western Region. AL AWEER Immigration Center, Near Fruit and Vegetable Market, RAS AL KHOR. People living in Sharjah can visit main Immigration office located near SHARJAH Mega Mall. Applicants from other emirates can visit main immigration offices to apply for amnesty. All Amnesty offices will work from 08:00 AM to 08:00 PM, Sunday to Thursday. There are many Indians living across UAE illegally due to financial or other unknown issues, they are willing to apply for UAE Amnesty 2018 scheme in-order to get freedom of legal work in UAE, or to leave country voluntary. To reach out more beneficiaries, the Indian Embassy in Abu Dhabi and the Consulate-General in Dubai have opened a help desk, a hotline and an official email address to help maximum number of Indian expats living in UAE illegally to avail of the 3 months amnesty. "People staying illegally can directly come to the embassy or make use of the help desk and speak to a member of the embassy for details,"
or contact Indian Workers Resource Centre at 80046342 for further details. As per the survey, 1.2 million Pakistanis reside in the UAE, Pakistanis residing illegally in any state of UAE have been urged to apply for the upcoming amnesty scheme. A short notice sent out in Urdu to Pakistani community in UAE from the Pakistan Embassy in Abu Dhabi and Consulate in Dubai said that all Pakistanis should make use of the amnesty scheme that starts from August 1 and ends in October. "All those who do not have travel documents (passports) should contact the embassy or consulate," read below notice. "We are ready to assist our overstaying kabayans (compatriots), especially with documentation that may be needed by authorities. The fear that they are illegal will be removed, and there are no punitive actions to rectify their status. After applying for amnesty, those who opt to stay will be given visa valid for six months to look for suitable employment. With this, they can have the flexibility to look for a better job." The Philippine Consulate has been receiving numerous inquiries, the consulate's official Facebook page and even my personal FB messenger are filled with enquiries about the upcoming amnesty," he said. He more added that a special team from the Department of Foreign Affairs in Manila will augment the Philippine consulate staff in Dubai. He also assured the overseas Filipino community of the consulate's commitment to assist fellow Filipinos availing of the UAE's amnesty in the most efficient and effective way possible." There is no Hotline (helpline) or Email address provided yet by Philippines consulate. 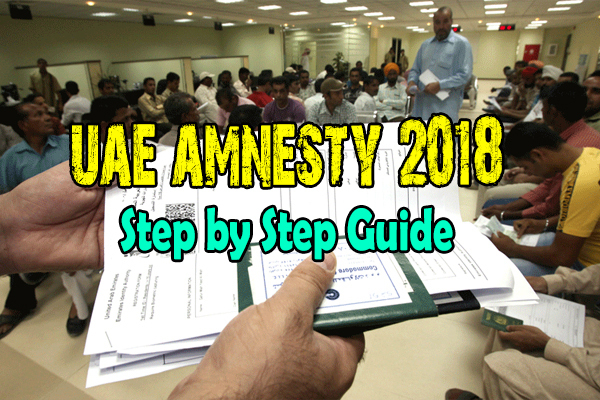 Hopefully this guide will help many, if you have any question regarding how to apply for amnesty or if you are looking for help regarding UAE Amnesty Required documents and Fees details, write your query in comments box, we will reply you as soon as we can. Why deleted comments? Its their view, PR?? Good reputes only to be show? Good day! I am overstay (August 1) after the Amnesty program. Is there any ways the government can help me? hi sir Good day I'm a Cameroonian by nationality I was in DXD for two years,so my boss put me abscond so I was deported through awi jail back home so presently I don't know my ban status in system so how can you people help me out so that I can come back. Can i apply for amensty for i have one year labour ban? You can visit sharjah amnesty office. How can he be inside uae, how can he apply???? ?, he has ban, he cant enter uae how can he solve the problem.he can only enter if the ban is done and labor case is also disolved, then he can enter again. Take help from your embassy. To rectify my status, do I need an offer letter from a new sponsor? Will I be given the temporary six months visa after rectifying my status at Amer centres? Can you apply for amnesty if u become illegal resident after August 1? Illegal resident can avail amnesty? What about legal residents, then employer to employer problem then the one filed case to the employee, now the victim is banned blaclisted, he went home for the fear to be illegal resident, then why not cover this with the amnesty? Its not his mistake, its the employers! Good day. I worked in dubai on year 2005, left uae for 2006 and was not able to finish my contract. Is there any way where I can check if I can travel back to uae for a visit or my prast employer filed a ran away case against me? I dont know if my past employer filed an absconding case against me. Thank you and hoping for your reply. Hello, my employer wrote runaway against me last year whereas i was in abu dhabi jail, when i gained my freedom and came back he told me he has absconded me already that my phone was not going throgh, mmy visa will expire frst week of november, so do i need to apply for amnesty? Hello, the person is out of jail and work permit still valid, can the abscond case be remove by the amnesty scheme? my brother is in UAE jail now due to cases of debts and he was also overstating, now he will be deport after serving his jail term, can he apply for amnesty from inside jail? Kindly clarify that exit papers will be given for a particular time limit during which the person can regularize his/her status or has to go there with the new sponsor who will show the company quota to the immigration for the employee?? I have abscornding case, my visa still valid till november 2018, can i pay 500aed to clear the Runaway Case and cancel the contract from immigration in october using the amnesty? My concern is my wife has a lifetime banned issued by the airport immigration as there's a case filed with her. but now, the local sponsor who filed the case is wiling to help to remove the ban. can you please advise me what to do so I can bring her back to Abu Dhabi. My wife is already in Philippines. Cases like this has no benefit to the amnesty. Even the person has sponsor already and the only problem is that person is outside uae can not avail amnesty. Unfair to those cases. Maybe they should also consider since amnesty is once in a lifetime. Can you just clarify onething which i think isnt clear.Applying for the six month visa,do we need offer letter prior to applying?And 500 to be paid before or after getting job? For applying amnesty we can go only at al aweer? or theres any other place that we can conduct application for amnesty? You can go any amnesty office but try to your neararest amnesty office in your area. is there any form to fill out for this application? and also, I already have sponsor for a year now, but still in immigration system it is showing that I have fines to settle. do you have any idea what is the fine I am having? and how long does it take to clear all this? thank you. Visit personally amnesty office and they will advice u fine could be wave off or no. Hi there, I have an existing case with my old employer in Abu Dhabi Courts, I have already won the case but the company has still not paid my dues, so because of that I am working with my new employer with a temporary work permit, can I use this amnesty period to change my visa to the new employer while the case is still existing in the court. As right now I am working without a visa but with a temporary work permit issued by the court. Check personally amnesty office but would like to inform that your problem not comes under amnesty programme. Yes but must check first status of parents also. If you complete your visa term and no problem with your old employer, you can apply for new visa. Yes , but should be no life ban of your passport. What are the requirements needed for the amnesty for those who are already cancelled but overstayed and she wants to stay here in uae to find a new job? Thank you..
Assalamo allaikom wa rahmatullahi wa barakato..
good day i just want to ask if its possible for me to avail an amnesty if im outside the country..or is it authomatically remove becoz i have an absconding case last year because i didnt exit emmediately..can i enter in UAE? Hi salam..just want to ask that can I avail the 6months temporary visa, even I'm overstay for a few days only and I was cancelled visa and I have a labour ban.and should I pay any payment for that if I can apply and how much it cost and what are those documents u needed ma'am/sir..? I WANT TO EXIT AND COME BACK AGANIN. MY PASSPORT IS VALID FOR 2 MONTHS . Could you clarify whether the person who is staying outside of UAE with absconding report can also apply for the amnesty? You must clear this first with your old employer. Hi, thank you very much.for explaining this in a board way. My question is this.thosr who have abscond in their visa will they be ask to exit from the country. Good morning. I want to ask if the runaway case for housemaid is included in this amnesty 2018? And I want to ask if how can I know if there's any other case filed against me by my employer.. Please I need your help. If the three months tourist visa av up to20months overstay since amnestey av waved all the fine can the person apply for six months visa without exit the country? Can some one who ask 20 months overstay apply for six months visa without exit the country? Hi good am.I'am a Filipina. I am working as a maid for morethan a year already but my visa was expire on june almost 2 months overstay already. and i'am not sure if my employer will still renew it i just dont't want to like my co-maids here which they didn't that came before me who had over stayed already more than me and yet they didn't process the visas. I wanna avail and take a chance of this amnesty . I am planning to talk to my boss when they arrive from vacation about it. And one more thig is they give salaries always delay thats why i wanna leave here and find anotherr jov though this amnesty hoping that this may help. What do i need to do? THANK YOU VERRYMUCH..
My visa expired 24 and I want to apply for new visa,do I need to go meet my agent to apply for another visa or the immigration that will make d visa and I pay them,please how does the new process work. Outside uae should be considered, we have same embassy to embassy, labor to labor, immigration to immigration etc. Why the need to people show? We have electronics nowadays, electronic signature, emails, scanners, etc. Its unfair right? You dont even know the reason. Automatic blacklisted without any investigation to both side, only the complainant are on their side, without any asking the victim. They should investigate each case, and impose punishment if applicable to, not that the employer filed case then approved then the employee is the one suffering, WHAT IF EMPLOYER IS THE REAL REASON TO THIS, justice plsssz? I entered dubai on a month visa, i got a job but my employer did not do my work visa. Now my one month visit visa will expire on 11th August. Can i apply for amnesty after that and can i get the six month visa to look for another job? Mam gud eve we want to apply amnesty but how? ?were working as housemaid and were in the house all of us wants to go out this house because our Sponsor very strict we dont have day offs they deduct our salary without any valid reason.forcing wake up early to start the work early 3:30 am .and our work finished around 10-11pm .can we avail?? I cancelled my Visa by myself.my sponcer abscond from this country,so I cancelled by labor office Sharjah.I got 1 year labour ban. Entered illegally? Is covered by amnnesty. But entered legal in uae, just absconded from employer to employer problem, and get blacklisted, bans, not considered to the amnesty, why not try to ban or blacklist company's like that. Who can not process properly the papers of the employers. The employers is the one sad here they dont habe voice or power to fight becuase almost is one sided. DO NOT SUFFER YOUR SELF FROM ANY BREAK DOWN,CURSE, SICKNESS OR ANY KIND OF SPIRITUAL SET BACK. COME TO Dr joy FOR YOUR HELP. Authority is king! The spell that i provide is the ultimate fast results, The best spell casters/ Herbal Doctors are not easy to pick out! Many hearts are broken every day and many people suffer in vain. Don’t be one of them. Let me help you with your case. My powerful spells can STOP A DIVORCE and much much more! and I am considered one of the most powerful spell casters with White Voodoo. I can help you. I have a big range of powerful spells to use for your needs. What outcome do you want? You might wonder how the spells will affect you? Will the spell be helpful? YES! The spells I cast for you will not have any unwanted side effects such as bad Karma. As long as the intentions are pure out of love as I am sure they are, right?. Magic is actually an energy from mother earth that can be controlled. Specializing in the fields of Love, Money, Power, Success, Pregnancy, Sickness, Luck and Witch Craft. I can help you with any problem or wish that you might have. Email me at: joylovespell@gmail.com , you can also call me or add me on Whats-app: +2348100452479. Hi.i apply already the amnesty because I am overstay.I've been to Al aweer I did eye scan and fingerprint now they told me to come back there after 10days.but before they told me to make a medical report..in uptown mirdif I pay 762 all.so I'm asking I need to pay also in Al aweer for the visa?beca bec the medical we did is cost 762 because it's pre-employment it says and they told me that this is only for medical report.not a mesimed with insurance. sir am a nigerian by nationality,i i complected my two years contract with a company in uae before going to my country on vacation,but before i left i renew my contract with the company hoping to stay in nigeria on a month vacation and start resume the new contract that i signed,but getting to nigeria issues beyond my circumstance arise that kept me hostage for over 16 months.i want to return to uae i dont know if i have labour ban if yes,how do i benefit from this amesty program.please sir reply me i am in dying need for your answer. I entered abu dhabi 2015 to work for 2yrs in a home care, then 2017 i finished my contract. They cancelled me december 2017, but in my passport visa the validity is february 2018, during my 1 month grace period i found a new employer and process all my papers they did not allow me to go exit because they told me they will process all my papers, then my ex-employer filed an absconding case against me because he want a copy of my visa, i told my new employer and the only thing that we sent is the MOHRE job offer but my ex-employer did not want to acknowledge that he wants a visa copy, so me and my ex-employer decided that i should just leave uae with my own expenses, so i leave uae march 2018, the airport immigration scanned my eyes and until this month of august i am still here in my country waiting for my new employer(PRO) to process all my papers but i think they are having a hard time issuing my visa, now all my sacrifices and career are hanging because i dont know who to blame and why this happens.but still i am having faith that i might consider in this amnesty regarding with my situation because of such people who are opportunist and people who are not familiar with the laws are wretched.hope this is aneye opener to everyone who has the same case amd to people who are also not familiar with laws. Thank you and i hope for a fast reply! Entered uae illegally and overstayed for how many years, entered uae legal and overstayed, some are absconders and with legal cases and illegal cases these are covered with amnesty. But legals who entered uae complete papers, and abscond by some employers without considerations with only small mistakes, so theres nothing they can do to just leave the country and blacklisted by cases that is not related to criminal, some are employer to employer problem but the victim is the employee, and now the worst thing is they also blacklisted, i think the cabinet should consider them even if they are outside uae now to avail amnesty,bcoz its unfair, a little consideration for those cases also. So that many more people will be happy. Come to think of it.UAE AMNESTY 2018 TO ALL. My overstay started Aug 24,2018 I got cancelled last July 24,2018 can I avail amnesty? Good day sir/ ma'am, thank you for making our queries easily answered. I am a private driver of one divorced employer she is very nice at first and as months goes by like anyone have mood swings. We are open with each other and share a lot of insights in life we have lots of secrets, all is doing well with us,until one day,. just because her bestfriend whoisn't my sponsor didn't like me for reasoning out why I picked up wrong bag I should bring her the make up bag instead of perfume bag she scolded me too much. House driving job is good , though sometimes during Eid is our job work 24/7 but it doesn't matter but 2500 monthly salary and food that we need to sustain our tired body is enough, what's more degrading is in return you will be told majinuna, crazy, akmara, shuhada is never an issue to us, just we ignored. But sometimes we reason out . Now if reasoning out or saying sorry is bad all people with good heart will be fired . Just because of little misunderstanding of reasoning out is misunderstood of talking back? She can make her workers life miserable, she told m I will ban u and make u blacklisted...I said for what madam I didn't do anything bad to you , I drive your friend your family your niece your nephew and even not a private driver job I accepted and not complain. Just because of your friend told you change me as your driver you listened to her. I even have an apology note to you . She cancelled me July 27 2018 , when she learned about amnesty coming august 1 2018 and I still have my visa active that time ...so I keep monitoring my status...until it finished I applied other country but my visa didn't arrived yet .I've been good to her family. But I don't know what she wanted make my life miserable to put obscunding case on me.even I told her that I will look for another job and she said no you cannot I started working with her Sept 1 2017 and she cancelled me July 27, 2018. Now I'm facing obscunding case. I paid my 2 days overstay but she still obscunded me for what reason? Hi due to one case i was unable to cancel my visa after 3 years i went to court and clear cases and i have new employer to get new visa even old company not cancel my visa can i get new visa and i can get get this matter by PRO or i have to visit myself ? can do it from immigration dubai or i have to go to aveer can handle theis case by company pro? good day! can visit overstaying visa can apply amnesty? thank you and have a great day! I absonded from working in 2006. I'm not able to get a visa back is it possible to send someone who stays with my passport to pay the 500aed. What about a person having police case by the bank due to credit card and car loan non payments? He is jobless and cannot pay for that amount?any help by amnesty? Good day sir/ madam,please I need your candid guide line to get exit permit. Have been to the immigration they keep asking me to bring police report and the police also directing me to get a form from immigration regardless of the form from my consolate, this is how have been moving in between immigration and police for four days now without positive result. Have spent so much on transportation. Am confused please help me! Sir I am absconded from Abu Dhabi with eye Scan no criminal record now I am in my home country and I have get job again in Emirates so what kind of clearance i need to re inter. please help me about details. I applied for visa on 25th Oct but still didn't recieve the massage. I am in different scenario. My passport is with PP for my 2 cheque bounce cases which I have cleared 10 days ago. I am also marked absconded in MOHRE and applied for removal on October 11 2018. But till now nothing is happening nor company is helping. My visa has expired on August 2 2018 buy before that I was marked absconding by my company so I assume it's already cancelled. All this scenario donot let me apply for amnesty. Dear Sir, in 2017 my friend was sent back to his country (pakistan) from the police station after he served his jail term and cleared his fines. He had absconding case with life ban from his sponsor in Ras al khaimah. How can I help him to lift his ban. I have his passport size photos and passport copy. please advise. I left my previous employer and my visa was never cancelled. now my visa is expired. I am not sure if they reported me absconded or not. I want to avail this amnesty but afraid if i go they might catch me. what should I do? I have couple of bank cases as well now due to this. please advise or suggest a lawyer please.